ReMix AV Solutions - 4141 Hohner 560PBX-G Special 20 Harmonica, "G"
/ Folk and Traditional Instruments / Harmonicas / 4141 Hohner 560PBX-G Special 20 Harmonica, "G"
4141 Hohner 560PBX-G Special 20 Harmonica, "G"
Hohner 560PBX-G Special 20 Progressive Harp, Superior Response and Warm Dark Sound! 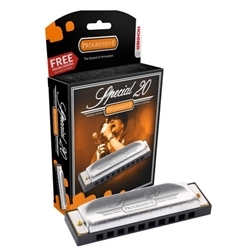 The legendary Special 20 harmonica offers unique qualities in its response, superior bending, and a rich tone. Featuring a durable, airtight, plastic comb, it has become the harmonica of choice for recording artist John Popper (Blues Traveler), as well as musicians that enjoy a wide variety of genres from country and folk, to rhythm and blues. Available in 12 major keys as well as a special Country Tuning, which features a major 7th when played in the cross harp position. With their excellent response and great tone, diatonic harmonicas from HOHNER have earned a worldwide reputation for the finest quality. They are frequently referred to as "Blues Harps" and are primarily used as melody instruments in blues, rock, pop, country and folk as well as other styles.